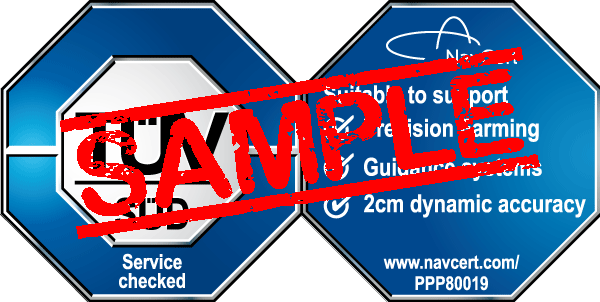 This certification mark is awarded to a ground-based correction data service for satellite positioning allowing real-time positioning up to an accuracy of ±2cm. Verification subjects are real-time positioning accuracy, availability and quality of the service for in-motion farming applications. Precision farming (PF) refers to site-specific and targeted management of farming areas. Precision farming is designed to consider the differences in soil and yield potential within a field. The machinery and equipment needed for precision farming in a field generally use (sensor-controlled) navigation systems and GNSS receivers as well as special equipment for demand-oriented site-specific application of growth regulators. Certification of the system to be tested verifies that PF satisfies the requirements regarding availability, reliability and accuracy of the correction data. Guidance systems are DGNSS-based equipment enabling users to drive equally spaced straight (parallel) tracks, curves or circles. They help to prevent skips and overlap and thus reduce material consumption. A guidance system makes high demands on the precision and reliability of a DGNSS system. Refers to the accuracy shown by the system to be tested in comparison to the reference system (GNSS positioning system + RTK base). This accuracy is an important criterion for precision farming and guidance systems.